After a nice, long vacation in Italy I’m back and ready to get back into my routine. I must say, while I do love traveling, it’s always nice to get back home and back into the swing of things again. And I’ll be the first to admit — I definitely overindulged a bit in Italy. I’d be really happy if I don’t have to look at a piece of cheese or pasta for quite some time! While it can be frustrating to come back home and realize that I am going to have to be extra-careful about what I’m eating for a couple of weeks — I realize that everyone falls off the wagon a bit every now and then. Rather than beating myself up about it, I give myself a little time to get back on track and recommit to eating healthy and getting some good old exercise! When I got back, of course I was craving lots of veggies and fresh, delicious, low fat foods. Lucky for me, my little sister, R, just moved into the East Village for the summer and my rents were in town to help her out. Being in hipster heaven, we all decided to take a trip to Angelica’s Kitchen, a favorite restaurant of mine and a famous New York vegan instutition on 12th st and 2nd ave. We even dragged my dad, who never saw a piece of steak he didn’t like. Upon entering the restaurant he asked, “So how’s the burger?” But even my dad was surprised by how yummy-delicious vegan food can be. We enjoyed a ton of great dishes including their dragon bowl (macrobiotic veggies, tofu, and brown rice) with delish carrot-ginger dressing (R and I wanted to drink it, it was so good), quinoa lemon croquettes, and delicious black bean enchiladas. And to top it off, the restaurant is BYOB. Just make sure you bring some extra cash (in true hippy-style they don’t take credit cards). Now if that’s not what you would call a plateful of health….I don’t know what is! looks a lot like what i plan on ordering at Candle Cafe on the UES tonite. YUM! and on the right track! This looks so great, and it makes me happy to see that there is a restaurant like that in New York. 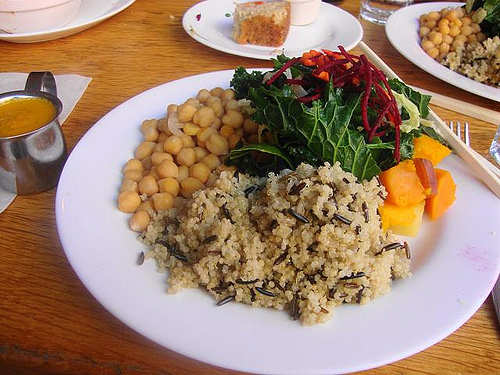 My mother started cooking macrobiotic style a while ago, and I found myself liking it a lot. I feel better, and more energetic too, everyday. I’ll make sure I visit this restaurant during my visit to the states.